Kerriann Cooper, Jaicie Halleman and Kelsey Traylor. For these three Hillsboro High School seniors, tonight's basketball game was one they had worked very hard for the past four years. It was THEIR last home game, THEIR senior night. But as the Lady Hiltoppers prepared to take the court for warm-ups, it turns out it was someone else's night to shine. Before coming out onto the court, the announcer said that tonight, the Lady Hiltoppers were wearing purple "A Grace Filled Journey" bracelets and were making our sweet little, Grace, an honorary Lady Hiltopper for the game. Wearing purple bracelets was a pretty big deal too, since they were playing a very tough county rival in the Litchfield Purple Panthers (whose school colors are purple and white). Grace and I sat in the players' chairs as the girls ran out and the crowd cheered. Each of the girls came over to say hi to Grace before starting warm-ups, and presented her with her very own Hillsboro Toppers shirt. I couldn't stop smiling from ear to ear, so proud of this little girl for her courage and strength, and most of all her beautiful smile. 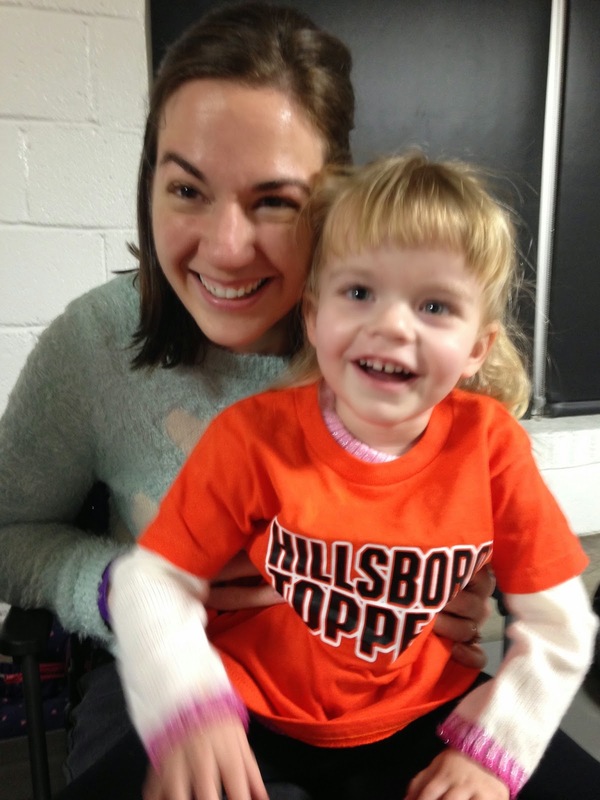 Mommy and Grace, an honorary Lady Hiltopper tonight! We headed up to the top of the bleachers (because there was such a huge crowd for the game tonight), and cheered for the Lady Toppers. It was an awesome game, very close the whole time. And Grace loved every minute. In fact, one time, I got out a princess book for her to look at, and she kept looking over the top of it to watch all the action. Although nothing is impossible, it's not very probable that Grace will ever have her name announced and run out to the court for the Lady Hiltoppers. But, we will always be grateful for this year's team, coaches and parents for making Grace an honorary Lady Topper tonight. We couldn't be more proud of our favorite Topper. As the mother of a former Lady Topper, this made me smile and cry at the same time. I am thrilled, and I know Faith's team would be also, that Grace is now a Lady Topper too! Such an honor to have Grace as part of the team tonight! We love you, Gracie Lou! Hard to miss that lovely smile. She can turn any day into fun just by smiling. It is soo contagious. I try to check the blog daily and just showed Mom all the beautiful pictures. She said she doesn't have any pictures of Grace and the pictures are beautiful. Love and prayers to all.